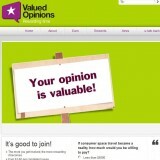 “Valued Opinions”, found at valuedopinions.com, is a paid survey site owned by Research Now Ltd., which is under the umbrella of parent company E-Rewards Inc. If you get to Valued Opinions through valuedopinions.com, you are at the U.S. site. You can also become a panelist through ‘Valued Opinions’ if you are a resident of the UK, Canada, Australia, and New Zealand, but the addresses for the companies from those countries are slightly varied. Valued Opinions is a reputable paid survey company. Unlike some companies, though, you can no longer get paid with cash, check, or through a Paypal account. But again, “Valued Opinions” itself is indeed a legitimate company. The number of paid survey opportunities you can expect varies with Valued Opinions as it does with any company, but it appears 2-6 a month is a reasonable number to expect. You will also be sent surveys called “Hot Topics” from Valued Opinions which do not earn you monetary credits, but rather give you opportunities to increase the number of surveys you might qualify for as it broadens your “profile”. It is a good idea to fill those out if you want to maximize your earnings potential. New members are also entered into a quarterly sweepstakes to win a Samsung Galaxy Tab 10.1. This would be on the low end of sweepstakes prizes compared to some companies, but I wouldn’t think signing up to take surveys in hopes that you will win a sweepstakes is a good reason to participate in the first place. If you are looking to make a significant amount of money in a short amount of time, participating in survey taking opportunities is certainly not your best route. But if you have time to spend and like expressing your opinion on products and services, and don’t mind the fact the monetary compensation is rather small, then perhaps paid survey companies could be a fun thing for you to become involved with. Valued Opinions will not make you wealthy… but they are indeed a reputable survey company who’s members overall seem to be pleased. If you don’t mind not receiving your compensation in cash, check, or Paypal deposits; signing up with Valued Opinions is a legitimate way to get a small amount of compensation doing something that might be fun for you. I do not recommend “Valued Opinions” even though it is a legitimate business.